Why Come to Westbourne, Dorset? Westbourne, Dorset (not to be confused with the other one in Hampshire) has been dubbed an “Urban Village”. It is very much an integral part of the conurbation of Christchurch, Bournemouth and Poole. However, it manages to maintain not only its identity, but a life of its own. So often, urban sprawl can be the death of the smaller villages that get swallowed up. However, far from suffering this fate, Westbourne has bucked the trend. Not only has it become fashionable, it has a life and vibrancy of its own that reflects the small community and identity. Community spirit ia alive and well here. Virtually everything is available here. There is still a proper Post Office, Library and four major banks for starters. Not many communities can boast this nowadays. Despite the presence of supermarkets, there is a Butcher, Baker and a Fruit and Veg shop. The supermarkets are represented by a reasonably large Marks & Spencer Food Hall (taking the place of the previous Waitrose, which moved to a larger site in Parkstone), Iceland and a small Tesco Express in the former Methodist Church. What perhaps makes Westbourne, Dorset stand out is its arcade. Real old-fashioned covered and pedestrianised shopping! Covered in a separate article, this houses an eclectic mix of businesses. A old-fashioned hardware store, cafés and interesting shops full of curios are just part of this experience. Perhaps the biggest surprise is the UK’s smallest cinema! Just 19 seats, The Colosseum is located in the basement of one of the cafés. But even all this only scratches the surface of Westbourne. There are all sorts of other shops and businesses, from clothing to artisan patisseries, jewellers to dry cleaners – and many more besides. An independent Bingo Hall still runs in the Grade II listed former Grand Cinema. Then, there are places to eat and drink. Three pubs in the main shopping area are complemented by a range of bars, cafés and coffee shops. The area is also very accessible, with good car parking, and excellent bus services. There is also a selection of places to stay, with several small hotels and holiday flats, and a couple of larger hotels near Alum Chine. Just over the border towards Bournemouth is a Premier Inn. 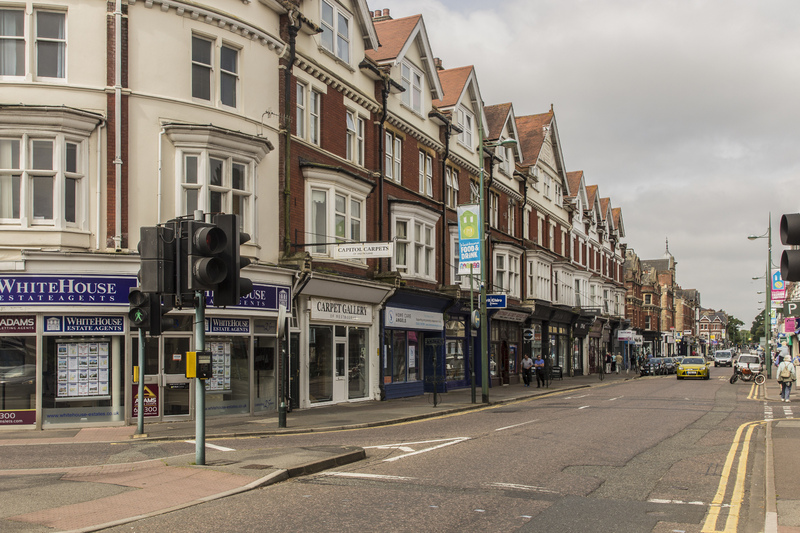 With the Golden Beaches the area is renowned for just a short walk from the centre at the bottom of Alum Chine, there really is something for everyone.